If you cant, then dont clamp it at all!. In here i have to program and machine several sets of roundish aluminum pieces with +/-0.001" outside tolerance. and within 0.002" thickness repeatability. Instead if fixturing it one by one i decided to skim cut a 33" x 23" x5/8" to within 0.0015 flat. 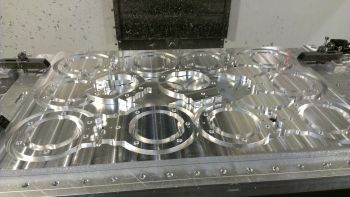 And then machine each piece completely leaving .005" outside to holt everything together. 2 types of parts 6 pieces each - 12 parts total per sheet! I'm doing something similar, can you explain in more detail exactly how your doing it, I'm having issues. Well, i think the 1st post is self-explanatory. But if you are having issues then i will be mose successful in helping you if i know what those issues are. Are you having hard time keeping them together? If yes then the trick to that is simple: rough and finish to within 30 thou from breaking through, and then finish only in 2 steps if 12 or so thou until you are within 5 thou wrom the table. The plate however needs to be VERY flat - otherwise some pieces may go balistic on you.